On Thursday 12 June, Whitehaven Coal was forced to halt clearing of the Leard State Forest where it plans to develop its Maules Creek coal mine. Maules Creek Community Council, represented by the Environmental Defenders Office NSW, sought an interim injunction in the NSW Land and Environment Court, to immediately stop the clearing during winter when animals, including threatened species, are hibernating in the forest. A judgment on the case was expected on Thursday afternoon (12 June 2014); however, Whitehaven instead has given an undertaking to the Court that it will halt the clearing until a full hearing on the matter, which is expected in early September. While Whitehaven claims that they are on track with the development of the mine, the reality is they have only cleared 130 hectares - just a third of the 375 hectares they had planned to clear in the first year of their plans. As Maules Creek Community Council spokesperson, Phil Laird, said: 'This outcome today sends a strong message to coal mining companies across NSW and to the NSW Government – if they will not enforce the law, then the community is prepared to step up and do it themselves'. 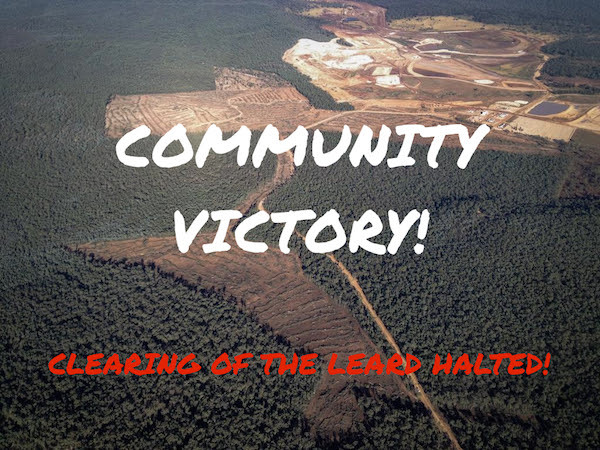 Whitehaven will continue with work to develop the mine in areas it has already cleared, so the battle is far from over, but this is a triumphant moment to celebrate: for now the destruction has been halted. The forest lives on, and the coal still remains in the ground. Community support and action has given the local community hope that this destruction can be stopped for good. You can read more about the action at Maules creek on the 350.org.au website and on the Maules Creek Community Council website. While the community's struggle for justice at Maules Creek is not over, this is an inspiring example of the power of individuals working as a community to stop destructive actions by big multinationals.